Today we're beginning to support authorship markup - a way to connect authors with their content on the web. We're experimenting with using this data to help people find content from great authors in our search results. Google said clearly, "we may look at it as a signal to help us determine the relevance of that page to a user's query." To identify the author of an article or page, include a link to an author page on your domain and add rel="author" to that link, like this: "Written by Matt Cutts. Matt has also written lots of articles for the Foo Times. 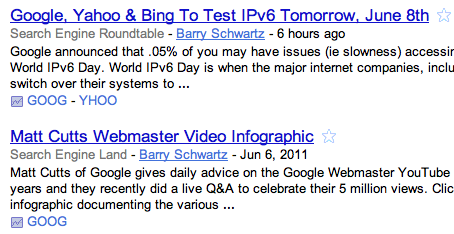 The reciprocal rel="me" links tell Google that the profiles at http://mattcutts.com and http://example.com/contributors/mattcutts represent the same person. Matt Cutts tweeted saying, "one big potential win is that web could move from disjointed web pages to learning about great authors on the web." Google News does let you search by author. For example, find some of my stories across this site and Search Engine Land on Google News. Will it work the same or better? Time will tell.